I recently had the opportunity to review the sample pack of jerky from Jerky Dynasty. Jerky is the perfect snack and some of the best jerky is that from wild game. Jerky Dynasty has plenty of choices to choose from and you will not be disappointed. 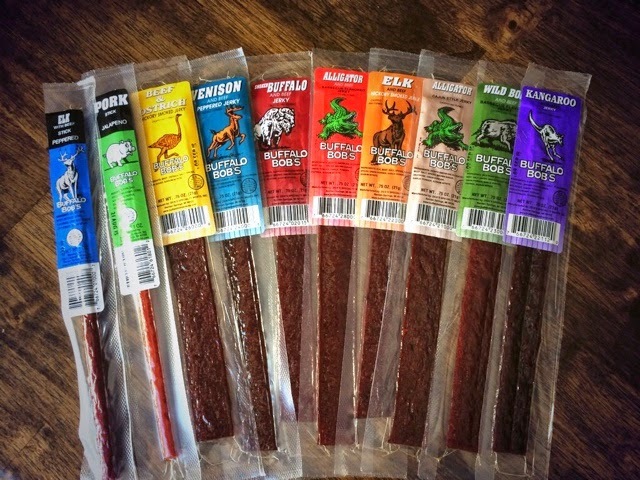 They have your typical elk and deer jerky but they also have a wide variety of exotic jerky as well. If you haven’t expanded your jerky tasting experience and tried alligator, ostrich, or kangaroo; you have to check these guys out. I was excited to give these different types of jerky a try. The folks at Jerky Dynasty know what they are doing. I had never tried some of these types of jerky and was excited to give them a shot. There wasn’t one that I was disappointed in at all. If I had to choose an favorite, I would have to say that the best one was hickory smoked elk. I am biased to elk jerky because it is my favorite. I had never tried ostrich or kangaroo but they were amazing as well. My top three would have to be hickory smoked elk, buffalo, and the kangaroo. You have to check these guys out. Be sure to give them a follow on Twitter @JerkyDynasty and Facebook and let them know I sent you! The quality of jerky was fantastic. The jerky itself is not overly dry or tough. This is definitely some very great quality jerky from a very impressive company. These would make great stocking stuffers for the upcoming Christmas season so be sure to go check Jerky Dynasty out and give them a follow on twitter.